Actually, I have a MacBook Air and I love it so much. I use it for multiple stuff such as watching movies, video chatting, photo editing, and even video editing. However, I noticed that it is filled with a lot of clutter. So I decided to delete files and folders on my Mac device. Fortunately, I succeeded in cleaning and removing the files and folder properly for fast performance. Therefore, here, I would like to share the experience of how to delete files on Mac. Hope this article would be helpful for you all who are seeking ways of how to delete files on Mac. Step 01 - You simply drag and drop the files towards the Trash. Or, you can right-click a file and choose to move it towards the Trash. Step 02 - After which, you have to launch the Trash application. Step 03 - Choose Empty Trash or Delete Permanently. That’s just about it! But, if you are really paranoid, what you can do is to use FoneDog’s Mac Cleaner. This has a tool called FileManager that makes sure deleted files cannot be recovered in any sort of way. The Mac Cleaner helps you delete unnecessary applications without leaving any leftovers behind. Plus, it helps in securing redundant searching history. Finally, it helps in the management of extensions, shredding of files, and cleaning of browsers. Step 01 - Download the tool. Step 02 - Launch it within your Mac device. The main interface will show a variety of the device’ system status. 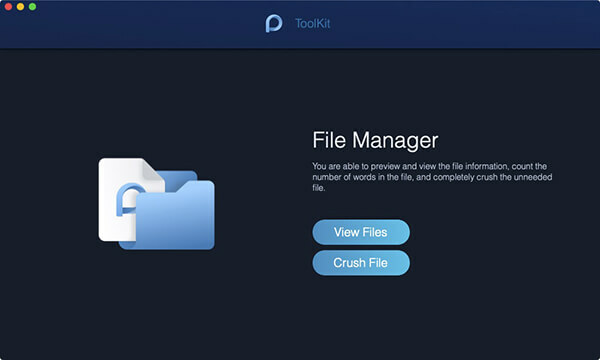 Step 03 - Select FileManager under the ToolKit module. Step 04 - Choose Crush File. Step 05 - Drag a file on the screen to shred it. Note: Ensure the file is the one you want to crush because it would be unrecoverably removed on your Mac. Step 06 - Press Crush and confirm the crushing operation. Step 07 - Wait until the crushing process is finished. You might simply want to clean up your Mac device to enhance its performance that’s why you want to know how to permanently delete files. In this section, will tell you seven different methods to help you clean up your Mac device. Let’s hop onto it! Do you utilize iChat? Then the application puts into storage your chats’ logs. Simply visit iChat and then go to Preferences. Press Messages and select the option Save Chat Transcripts To. After which, select a specific folder. By default, the applications usually save the logs within a folder named iChats (this is located within your folder Documents). However, you can select another location in order to store these iChat logs. When this preference is actually set, the iChat applications save log files of each and every chat you have. This is a good thing and is very helpful especially if you need to go back to a conversation for work purposes. But if you send out images on these chats, files stored can take up a huge amount of space. When you look on the iChats folder, you will notice that files are put into organization depending on date. Although you may wish to save a lot of chat logs you have had recently, you might still have months or even years of files you should delete. This will help you save a lot of free space. A lot of applications and programs has automatic backups. Copies of various files are stored in a specific folder similar to iChat saving logs of chats. Some applications give you the ability to choose where to put the backups. Others applications don’t let you do so. If you utilize any application that makes backups, you might check it out and see it has a lot of gigabytes of files (that might even be duplicates). When you delete or remove these backup data, you can save a lot of space within your device. Plus, searching through the Spotlight will become so much easier. You can also check the following folder: your user folder/Music/iTunes. Within this folder, you might find a folder named Previous Libraries. These can include various copies of your Library in iTunes that might have been saved thereafter an installation of a newer version. Do you receive email attachments? At first, these attachments are stored within your messages. However, if you open an attachment for viewing purposes, the Mail application puts a copy of the attachment into storage within your folder in the location your user folder/Library/Mail Downloads. The same is true if you utilize QuickLook to glance at the attachment. You might notice that a lot of files in this folder take up a huge chunk of your hard disk drive or solid state. The good thing about it is you can actually delete these files without the need to worry about losing data. If you still possess the original messages, part of these messages-- the attachments-- are still within it. Mac devices put a huge amount of log files into storage and most of it is unnecessary for you or your device. Simply go to Applications and then Utilities. Then open the application called Console. You will be able to check out the sidebar which has the window for Console Messages. This window will contain a list. The various logs files put into storage within your Mac device are placed into a list within the Console’s sidebar. You can actually remove these files without causing trouble to your Mac device. Plus, it will help you free up a significant amount of space since a lot of these files are huge in size. You can use a tool to help you delete these files to. In this way, you clear up more space on your Mac device and even help remove clutter. Most likely, you have multiple duplicate files within your iTunes Library. iTunes has a feature built into the application that gives you the ability to locate duplicate files. It also allows you to see if you have copied the same file twice. Plus, it also allows you to check if you have the same song from two different albums. In order to utilize this feature, go to File and then click Display Duplicates. This will display all tracks that have identical names and artists. You can also press down the Option key while selecting the File menu. Display Duplicates will now be changed to Display Exact Duplicates. This will show you duplicate tracks which have the same artist, name, and album match. It is recommended for you to check all the duplicates carefully. Deleting files that are duplicates and saving much need space on your Mac. Plus, it can help you free up more space within your iPhone or your iPad. iTunes can help you find duplicate files within your library. However, this feature is limited. To help you find duplicate files, you can use FoneDog’s Mac Cleaner. One of its modules is called Duplicate Finder and helps you find all types of duplicate files (e.g. songs, photos, videos, documents, etc.). It’s a great way to find duplicate files all throughout your Mac device. Do you use Apple’s browser Safari? Well, some of its features can actually take up space that can be used for other more important files. For example, the cache files of your browser which is used for making the browsing experience faster can take up a lot of space. When these cache files become so huge, they can lead to the slowing down of your browsing experience. History files can also make searching by Spotlight very sluggish. Plus, Top Sites, Website icons (also called favicons), and preview images of websites can lead to the slowing down of Apple’s Safari as well. What you can do is to reset Safari regularly. To do this, you have to go to Safari and select Reset Safari. Check the options that you wish to implement. Choose what you think is most important to you in order to reset your Safari. You can also use FoneDog’s Mac Cleaner for this. It has an option called Browser Cleanup that allows you to clean up all browsers in your Mac device. Comes in handy especially if you don’t know much about browsers. You probably download a lot of files every single day. So, have you checked your Download folders? It’s probably loaded with huge sized files you don’t need. This is located in your user folder/Downloads. Plus, there might be things that might cause problems to your device. Clean this folder up if you wish to have more space on your Mac device. You might have heard of the infamous iCloud leaks of images of celebrities. And because of this, you now understand the importance of digital data. There are a lot of reasons why you might want to permanently delete files and folders within your Mac device. First off, you might wish to resell your Mac device or donate it to another person. And because of this, you’re thinking about the security of sensitive personal data. Or you might be thinking about your Mac being stolen by somebody. And with this, you might be brooding over the fact that your data can be used for malicious purposes or be hijacked. Well, it’s actually normal for you to think and become paranoid. But one thing is clear. You want to ensure that your files are permanently deleted within your Mac device. It’s because you want to avoid the fact that somebody might hack your device and get private and sensitive information or data. The fact of the matter is that files that are already deleted from your storage device can actually be retrieved using the technology of data recovery. This is supposed to be used for the good--such as recovering data that has been accidentally deleted. However, some use it for evil means to hijack data and use for malicious purposes. The big questions are this: Is this still what happens as of the moment? Well, a lot of newer models of Apple’s Mac devices comes with solid state drives (flash storage) or even Fusion Drives (e.g. in other models of iMac). They use these in place of traditional hard disk drives (spinning drives). With these replacements to traditional hard disk drives, is it still necessary for you to delete your data securely? In this article, we’ll cover exactly just this. We will tell you how to properly or securely remove files within your Mac’s operating system which is dependent on your use of traditional HDDs or modern SSDs. So, why is it important to have solid state drives (flash storage)? Why do they matter? Well, it’s because it is easier to actually remove files completely if your Mac device comes with a solid state drive. This is because of the workings of a solid state drive (SSD) is very different from that of a traditional hard disk drive (HDD). This is true especially if your Mac’s internal drive utilizes TRIM command. In order to prevent Mac from slowing down like that caused by traditional spinning hard disk drives, the TRIM command enables the Mac operating system to wipe out data blocks immediately-- blocks that are already not considered as being used. This happens when you delete data through the emptying of your Trash or through methods of deleting files such as CMD + Option + Backspace or CMD + Delete. The TRIM methods result in the speeding up of the process of data access. Plus, it has the benefit of being impossible for anybody to do file recovery of any data erased from within a Mac solid state drive. On the other hand, Macs that use HDDs are completely different. Data can still be recovered by using a data recovery tool for Mac even if you have already emptied your Trash or utilized other methods of removing files from the HDD. This is true especially when data has not been overwritten fully. So, how do you know if your Mac device uses an HDD or an SSD? Different types of storage media are used for different types of Mac computers (e.g. MacBook Pro, MacBook Air, iMac, Mac Mini, Mac Pro). One example would be the year 2018. By this year, almost every new MacBook shipped are not equipped with solid state drives. However, some iMac models give you two alternatives to choose from, Flash Storage and Fusion Drive. To know more about this, just press the Apple icon on Mac’s top left screen. After which, visit About This Mac. And then, go to Storage. You will see a disk icon. Right under this disk icon, it will tell you whether the Mac device has a solid state drive (SSD) or a traditional spinning hard disk drive. If your Mac device has an SSD, you might want to know if TRIM is enabled within it. How to Delete iPhone Backup on Mac? Now you have learned how to delete files on Mac. The best way to do so is with FoneDog’s Mac Cleaner. It has a File Shredder option that allows you to delete files permanently making these files unable to be recovered. Simply, delete all unnecessary files within your system to free up more space on your Mac device and make it perform better. An all-in-one Mac software to clean up your Mac OS and speed up your Mac. How To Delete Cookies on Your Mac Device?